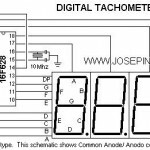 Do you want to build a tachometer? Here is the algorithm showing how it basically works. In English! Click HERE for the English version. ; Se recomienda una rutina de TEST aqui. variable byte bandera1 = 0 ; another "flag"
variable byte datac = 0 ; Auxiliary var. ; Here is the interruption based on Roman Black's code. 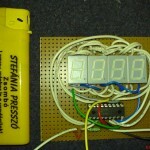 ; Every 500ms gets the RPM and displays it. goto int_exit ; nz, so definitely not one second yet. skpz ; z = both hi and mid are zero, is one second! goto int_exit ; nz, so not one second yet. if ! pin a5 then ; Pulse? / Recibio un pulso? if datac = 0 then ; 100's are cero? blank.